Crucial is a company that has been around for a long time as they are a division of Micron, and perhaps one of the largest memory manufacturers in the world. Last year, they blew us away with their new C300 drive and this year we expected something better - now that SATA III (6Gbps) has been around a little longer. 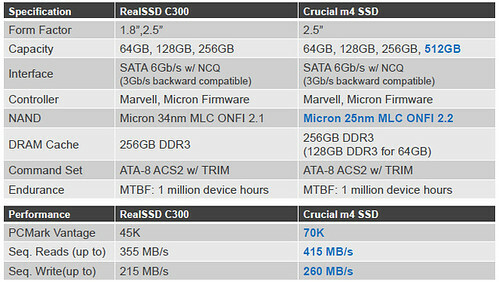 We were not disappointed as the first product they showed off was their new M4 SSD. This one is also going to be running on the speedy SATA 6Gbps interface and with some tweaked firmware, they have done some amazing things with their firmware and the controller to take things up a few notches. As you can see in the chart above, Crucial has dropped the 1.8" form factor and is also planning to release a 512GB version of this drive as well. They will release the 512GB version of this drive for about the same price as they released the 256GB C300 RealSSD last year. The performance looks to be pretty impressive for sure. The other interesting bit from Crucial is their new "Smart" Ballistix Tracer modules. They feature LED lighting - like other Trace modules as well as the M.O.D. capabilities of their finned Ballistix memory. They combine the two, with a new IC chip that allows them to change the color of the LED lights, change the pattern, brightness and even turn off the LEDs. On the management side of things, you will now have the ability to continue to monitor and log temperature data, voltage as well as how long each module has been running. They will ship in two color combinations. One will have blue & amber LEDs while the other will come in red and green. With all of the logging capability of these new modules, I'm sure they'll be able to find out peak voltage pushed to these modules as well. So if you're an overclocker, be careful that you don't void warranty by pushing 2.5v through these as they may be able to find out pretty quick. No word on that though - that's just my speculation. Please check out our other CES 2011 coverage here, as well as take a look at our full gallery over here. If you have any questions or comments, please feel free to post them at the "Comments" link below.